This tool was developed to support civil society organizations, citizens and civil servants in evaluating the performance of local state agencies, public officials and administrators with respect to access and provision of information to the citizen. To carry out this evaluation, it is important to create means of articulation with the local government to facilitate the access to information and documents. 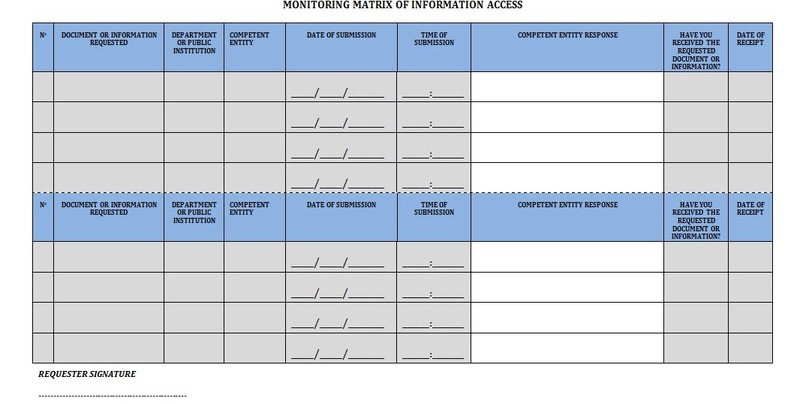 When the information is not provided properly citizens may use this matrix to make civil servants and/or public administrators take responsibility for the failures of provision of information to the public and measure the levels of flexibility and availability of information to citizens at district, administrative post, town and village levels. This approach allows evaluation results to be taken into account in annual planning and budgeting processes, and to support the government's efforts to address reforms in public sector, so the local government shall have access to this matrix to perform changes in the public sector in order to solve the problems found. To make this tool succeed the local government must have a crucial role. The public servants have to provide the information to the citizen, and they also must take into account the matrixes filled out by the citizens to make the necessary changes in the public sector. This may not happen if they are not willing to take these actions. Is this tool any different from community scorecards?